We went to Dentista Inc. at Shangri-la Plaza Mall two weeks ago because some of my son’s dental fillings had to be replaced. According to his lady dentist, Justin now has 10 adult teeth. She said my son’s adult teeth came out a little bit early as Justin is only 7 years old this July. Aside from replacing three of Justin’s dental fillings, she also applied dental sealants on Justin’s two upper molar teeth. Dental sealants are thin plastic coatings applied to the grooves and pits of teeth to prevent tooth decay. My son is really a big boy now because in the past, he would ask me to hold his hand while he’s being attended to by the dentist, but this time around, I was just sitting on a nearby stool while the dentist was doing her work. He was also not afraid anymore, but he didn’t like the buzzing sound of the dental instruments, which is why he’s covering his ears with both hands. Everything was done in less than an hour because Justin was a cooperative patient. 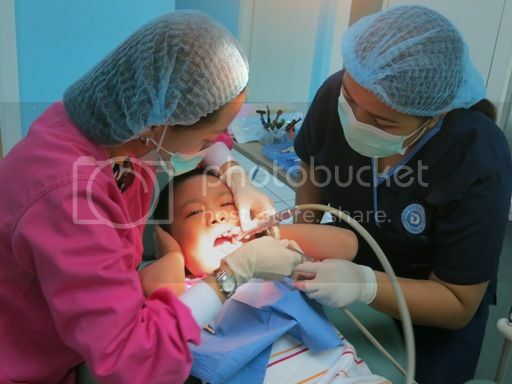 His dentist and this mommy were both happy that the entire procedure went without any hassle. This entry was posted in Dentist, Dentista Inc.. Bookmark the permalink. Justin is such a brave kid.